I don't exactly agree with RBG on every issue, but neither did Scalia—and they got along famously! It's just a fantastic story from start to finish: amazing childhood, neat college years, beautiful love story of a marriage, well-adjusted kiddos and grandkids who adore her, tremendous career as a lawyer who laid the groundwork for so many historical firsts (she won 5 out of 6 cases she tried before the U.S. Supreme Court as a young lawyer! ), and staunch defender of equal rights (and infamous dissenter when necessary!) from the bench. 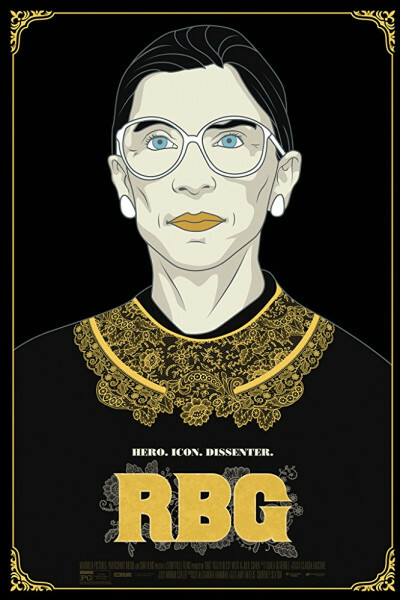 If you love stories of uncomplicated public servants who remain true to their calling from cradle to grave, you'll love RBG. Moreover, it's inspiring to see the many young women she's positively impacted, and riotous to revisit the many memes and impressions that have sprung up around "the Notorious RBG" in recent years. I strongly recommend everyone see this film, but particularly young women. It's a very encouraging trajectory and tale, and a great reminder of "the struggle" and the strategies that have and shall continue to overcome injustices.